For anybody who thinks salvaged materials don’t make for stylish interiors, homeowner Lyndsey Lewis of Little House in Little Rock is here to set the story straight! 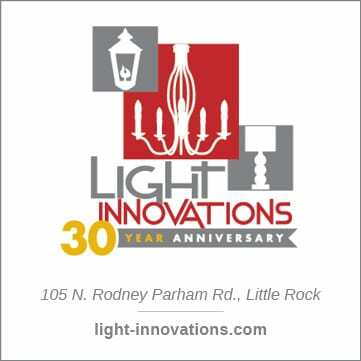 She’s been sharing the story of certified green home, being built by Bret Franks Construction in Little Rock, in a series called At Home with Green Design. Check out her first two posts (here) for more info about the construction, because today she’s getting down to specifics with sinks, hardware and wallpaper! One of the biggest perks of building my little house it that splurges in design choices pack a major punch without blowing my budget. Iâve planned for extensive trim work (bead board walls, wood planked ceilings, etc. ), custom storage units, unique hardware, and many other upgrades that wouldnât be feasible had I chosen more square footage. Iâve been collecting furniture, art, accessories, and fabrics throughout the entire planning phase of construction. My very first purchase was a pair of stained glass windows from Antique Warehouse of Arkansas, in Botkinburg, AR. One pane will be hung inside my kitchen window. The larger glass will be installed on the wall that divides my master closet from the bedroom. Itâs difficult to imagine, but this window placement will highlight the design of the closet space. 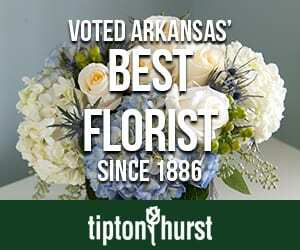 At Architectural Salvage by Ri-Jo in Mena, AR, I found a truckload of amazing salvaged doorknobs. There were ceramic, metal, and glass knobs to choose fromâ¦ and I ended up buying a few of each. To be able to utilize the knobs for my interior doors, I had to find mortise locks for the knobs. These locks fit antique spindles and can be found at specialty hardware stores. Unfortunately, each lock cost more than $70. But when you only have 4 interior doors, the cost isnât really a huge extravagance. Knobs that arenât used for doors will be mounted to use as hooks for the entry or master closet. Bathrooms are a great space in any home to add some extra âwow.â Unfortunately, bathrooms are also an area to add LOTS of extra spending. Wallpaper has really made a comeback since the floral mess that adorned my sisterâs bedroom in the early 90s. Iâm planning to paper my foyer ceiling with a watercolor-style print I found at Anthropologie. Since most wallpaper sells for over $100 per roll, Iâm very thankful for my 5âx5â entry. Less is so more. certified green home: progress update! The construction of my Whidbey is scheduled to take 6 months total. To date, we are just past the half-way point. So I thought this would be a good week to bring readers up-to-date on the progress. After grading the lot, framing began in early September. This stage was the first time I was able to walk through the actual-size space where Iâll be living. I had visited rooms with similar dimensions as my rooms, trying to get a feel for the scale. But walking through the framing was pretty exciting. After the framing was covered in protective sheeting, roofing was underway. This picture of my detached garage with carport is taken from my backdoor. There will be a walkway leading from my house to the covered patio. And yes, the garage is almost as big as my house! From the interior, these front windows provide tons of natural light for my guest bedroom. Although the space is only 9×10 feet, the walls of windows keep the room from feeling cramped. Next, the installation of Hardiboard siding and trim began. (Hardiboard is a cement product manufactured in strips similar to finished lumber.) This stage is a labor-intensive process that involves cutting each piece of board to size and then attaching it to the house. When painted, the Hardiboard will look like wood siding. And with that, you are up to speed on the little house. In the coming weeks, the interior will start to take shape as the sheetrock is installed and the trim work begins. This piece of art was a gift for my 30th birthday and will adorn my mantle. Itâs an original family portrait by Lewis, my 4-year-old nephew. If you’ve been following our “At Home with Green Design” series, you’ve gotten to know homeowner Lyndsey Lewis, as she’s been writing since November about the certified green home she’s building in Little Rock. Today, the experts at Bret Franks Construction (comprised of Bret and Jen Franks) talk about the process of building Lyndsey’s sustainable home. The key, they say, is in the planning. PS- Tour Bret and Jen Franks’ own certified green home in our July 2011 issue, here! Building a custom home always takes careful planning and forethought. Building a tiny home takes the importance of planning to another level. Then throw in Certified Green and Energy Star Qualifications, and it requires special attention to detail to make the dream a reality. In addition to the design, colors, fixtures and finishes that need to be determined, there are building code requirements, space planning, and Green points to consider. One important aspect of planning a tiny home is to verify that the home plan and location meet the International Building Code Requirements. Bret met with the City of Little Rock Planning and DevelopmentÂ Department before construction began to confirm that Lyndsey’s Tiny Tumbleweed home plan would conform to local residential buildingÂ and neighborhood design requirements. The design and location of the garage was also critical – not only for the aesthetics of a visible corner lot but for the storage needs of the homeowner. We felt it was important for the garage to be just as unique as the home without overpowering the diminutive size of the home. After discussing the storage needs with the homeowner (including a desire for covered space for two cars), Bret and I designed a single car enclosed garage with an attached carport – sometimes called a “lean-to”. The design was inspired by our recent trip to the South Carolina low country and incorporates space for a single car, a large amount of storage on two levels, a covered area for a grill, and a carport space for a second car which can also be used for outdoor parties with recessed lighting and a ceiling fan. Multi-purpose spaces are integral to tiny homes and their garages! The kitchen design also required considerable thought and planning. Before the initial cabinet sketches, we had many discussions with Lyndsey about what was most important to her – from the coffee pot location to the built-in trash can (a must when you have two curious dogs living with you!). And small space appliances from GE were also determined before the cabinet design was finalized. Everything in the kitchen was scaled to fraction of inches – because every “tiny” bit of storage space counts when your building a little house. After seeing its progress on the At Home blog, we were all anxious to see how Lyndsey Lewis’ adventures in green design would turn out. Finally, in July’s “Green Living” issue, we got to see the final result of all her hard work. So we asked Lyndsey to come back to the At Home blog and tell us what it’s like living in Little Rock’s adorable Little House! Take it away, Lyndsey! The little house project was less about downsizing my stuff and more about restyling my life. The process of building (and blogging) my home really woke up my left brain and reminded me to make time to be creative. With less time spent working (or driving to work) and less money going to housing, Iâm free to try out new things. My garden, started from seeds, has been a success! Not only does it provide fresh, organic groceries, but it makes the yard look like a domestic oasis. Cooking has always been a hobby, but it has a whole new dimension now that Iâm using produce from the garden. I also experimented with sewing (see kitchen cafÃ© curtains), which is frustrating, challenging, and extremely satisfying when things actually turn out (mostly) correct. Living in the little house, I really challenged myself to redesign the norms of my day-to-day tasks. For instance, caring for the âgirlsâ (see photo above) reminds me to think twice before choosing meat over other foods. I also try to make time to walk to work in the mornings now that Iâm living close to work. Even the way I do my laundry has been modified. Most of the time, the sun does the work instead of my dryer. Besides saving electric energy, thereâs something really pleasant about watching clothes flutter on the line. For more info, plus more photos of Lyndsey’s little house, read the full story on the At Home website here. To read about the making of, check out Lyndsey’s previous blog posts here. No one can appreciate counter space like those of us with small kitchens. Recently, I found a perfect solution to utensil storage at The Container Store. 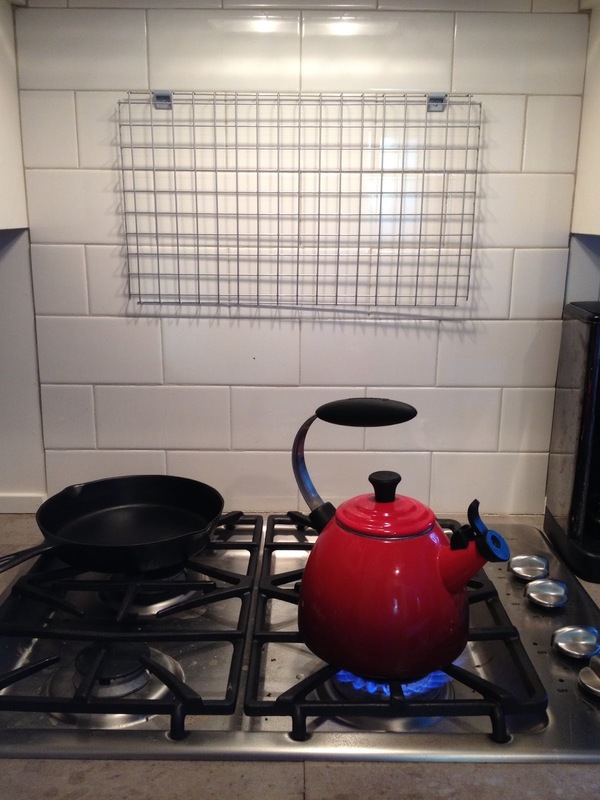 It’s called the Polytherm Grid System, and it really is a steal at $3.99-$9.99 per accessory. 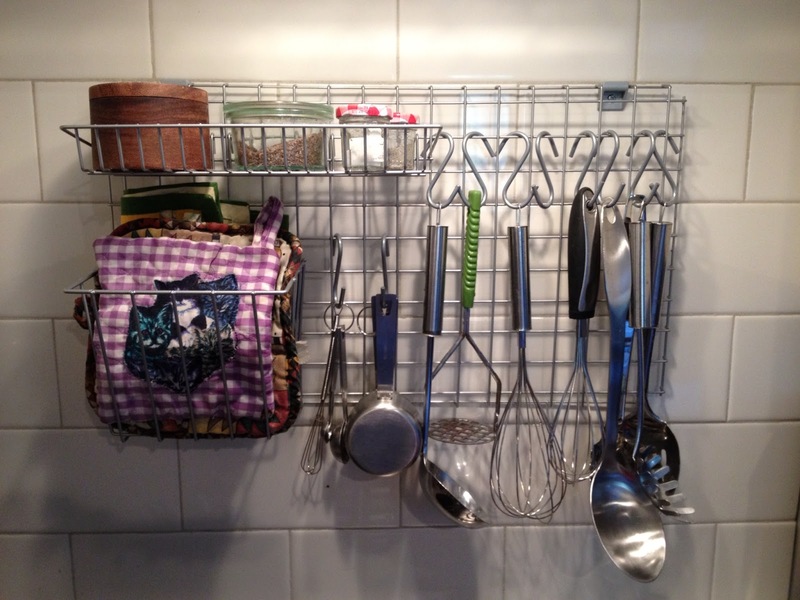 Obviously, these storage grids can be used anywhere in your house, but they were just right for getting my spoons, spatulas, whisks, etc. organized and easily accessible. I started off with a small grid, which included hardware for installation. I chose to drill the storage unit permanently into my tile back splash. 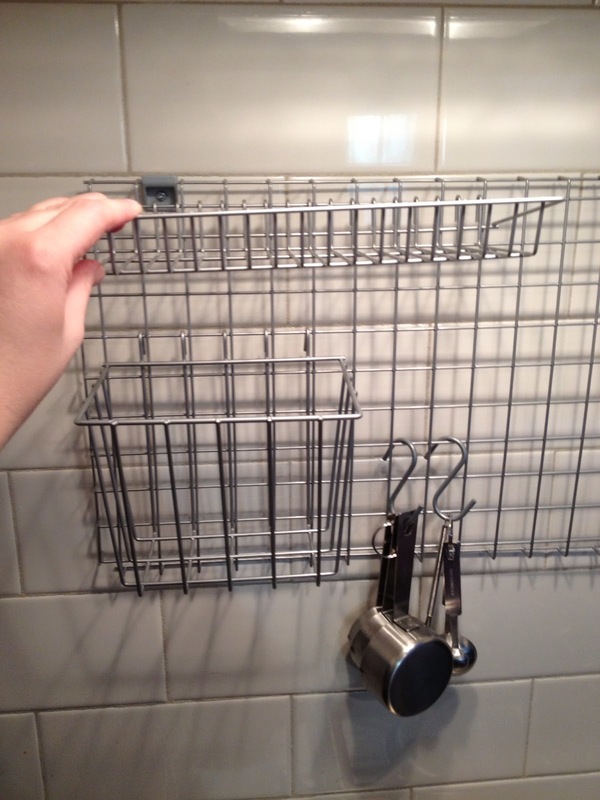 If you choose to mount the grid to your tile or granite surface, you’ll need to invest in a drill bit designed to penetrate those materials, around $5.00 at any hardware store. But if you’re afraid of committing, Command Brand adhesive could work as well. 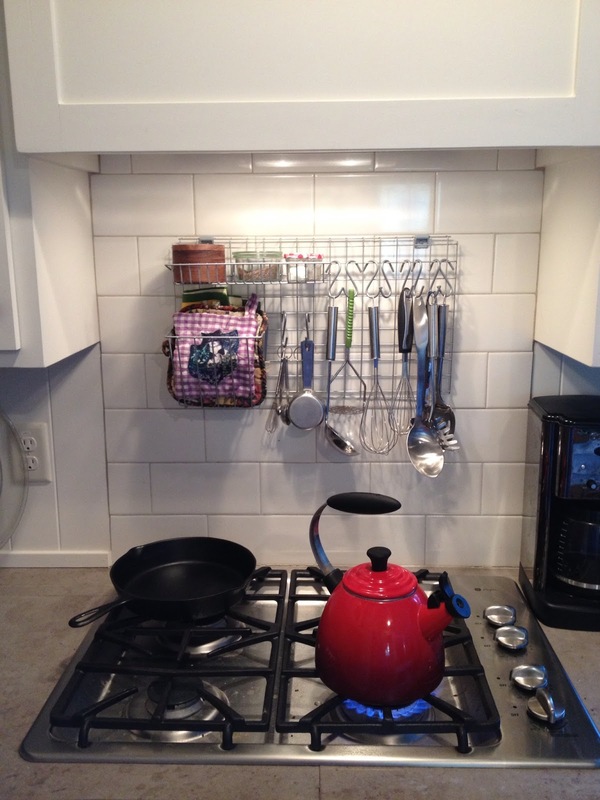 Next, I installed my accessories: a small shelf, tall basket and s-hooks for hanging. 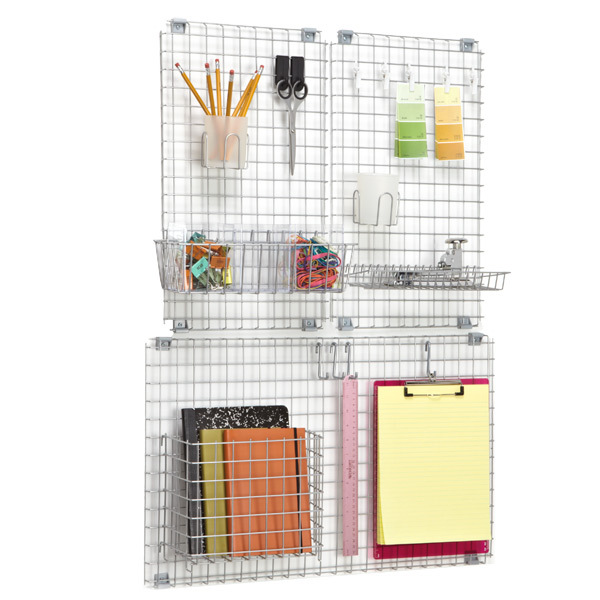 There are many more parts and configurations, so you can make the grid exactly what you need for your space. All of them are held in place with simple hooks, so it’s a snap to change up the design. The final step was adding my collection of utensils, spices, and pot holders that I use on a regular basis. Now there’s not more hunting for the salt or potato masher while I’m busy at the stove!